Over a month ago, US Secretary of State John Kerry significantly raised expectations about the possibility of a new UN Security Council Resolution (UNSCR) against North Korea in response to its nuclear weapons test on January 6. In connection with his trip to China at the end of January, US officials suggested that UNSC sanctions could target North Korea’s financial links, its trade links with China and its ability to import oil, indicating that these were the focus of a sanctions proposal made to China two weeks prior. At the time, observers questioned whether such significant sanctions could be secured given the necessity of Chinese agreement—or at least acquiescence—at the UN Security Council. There was common acknowledgment among the “experts” that, if China did go along with such a UNSCR, it would suggest a change in Chinese thinking about how to handle their North Korean neighbor and client. UNSCR 2270, adopted on March 2, puts at least some of these arguments to rest. It is a substantial escalation in UNSC sanctions on North Korea and, if implemented properly, will apply significant economic pressure on the Kim regime. Importantly, the resolution also breaks new ground, sanctioning specific sectors key to the North Korean economy, seeking to undermine the North’s use of and access to international transportation systems. Such measures were inconceivable prior to North Korea’s latest provocations, demonstrating that China has decided to pursue a new direction with its belligerent neighbor. 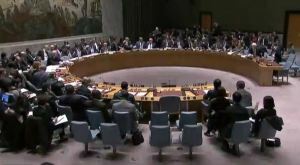 Whether the UNSCR achieves its objective of swaying North Korea from its present course of action is another matter: as I have noted in the past, North Korea will determine its own response to this international rebuke of its provocative behavior, and it could choose to escalate rather than enter into a diplomatic process to resolve the crisis. This paper first examines the UNSC sanctions regime against DPRK to date and then explores the major elements of the new UNSCR 2270. It concludes with two thoughts on the implications for North Korea and future diplomatic efforts to resolve the crisis. The four UNSC resolutions against North Korea adopted since its first nuclear weapons test in 2006 all focus on denying North Korea access to technology, materials and assistance that could enhance its nuclear and missile programs. Some of the most impactful sanctions were probably adopted in the first resolution, UNSCR 1718, on October 14, 2006. This resolution forbade North Korea from undertaking any further nuclear weapons tests or the launch of a ballistic missile, and imposed wide-ranging prohibitions on trade with North Korea in items related to its nuclear, missile, and conventional arms programs. UNSCR 1718 also imposed an asset freeze and travel ban against North Korean individuals and entities to be named later, and established a luxury goods import ban against the country. The resolution also authorized inspections of cargo shipments to North Korea that were suspected of containing illicit goods. UNSCR 1874, which was adopted in June 2009 after a second nuclear weapons test, amplified these existing prohibitions by expanding the reach of the arms embargo. It also added new language that supported the framework of inspections and interdictions suggested in UNSCR 1718, giving granularity as to the dimension of inspections and interdictions that are permitted and how to dispose of illicit goods once found. UNSCR 1874 also laid the groundwork for tightened economic sanctions, encouraging states not to extend North Korea loans or export credits for their companies still trading with the North Koreans. As with the Iran UNSCRs adopted in the intervening period between 1718 and 1874, the concept was to lay a predicate for states to enact their own economic sanctions, using the cover of UNSC support. Adopted in January 2013 after North Korea’s satellite launch in December 2012, UNSCR 2087 did not expand the sanctions regime against North Korea, but it did emphasize the importance of compliance with it. However, UNSCR 2094—adopted in March 2013 after the North’s third nuclear weapons test—did expand the list of individuals and entities subject to the asset freeze and travel ban established seven years earlier, as well as widen the reach of measures intended to deny North Korea support for its nuclear and missile programs. With 2094, it became sanctionable to transfer bulk cash and other resources to North Korea if a connection to North Korea’s illicit nuclear and missile activities was identified. Importantly, UNSCR 2094 made it obligatory for states to deny export assistance (such as export credits and loans) to any of their companies trading with North Korea, if the trade could assist North Korea in its proscribed activities. Similarly, UNSCR 2094 mandated inspections of North Korean cargo if reasonable grounds existed to suspect that the cargo contained UNSC-prohibited goods. In sum, the UNSC sanctions picture prior to the adoption of UNSCR 2270 was increasingly tough but still tightly linked to a demonstrated nexus between North Korean activity and its WMD programs. Such a link made it imperative for sanctions enforcers to have unambiguous intelligence that detected transfers were specifically in support of the nuclear or missile programs. Certainly, logic could help connect these dots. But, logic is not itself a sufficient evidentiary basis for significant enforcement action and ambiguity could be a means for countries to avoid taking action. Some of the provisions in these four resolutions could be interpreted either narrowly or broadly and, as such, they collectively depended on the will of North Korea’s major trading partners to take action in order to have any real value. Taken in combination with the modest impact these measures had directly on North Korea’s ability to engage in international trade, the effect of the sanctions was largely limited to denying legal access to nuclear and missile related items. If North Korea possessed the ability to obtain such items through smuggling or could produce them indigenously, then the direct damage wrought by such sanctions was even further minimized. UNSCR 2270 has significantly changed the picture of the UN sanctions regime against North Korea and created probably the most comprehensive, legally-binding sanctions program imposed against a country since Iraq in the 1990s. Its provisions cover both military programs as well as broader economic concerns, targeting major North Korean economic vulnerabilities and potential pathways for its continued procurement of any foreign items necessary for its nuclear and missile programs. Prohibition on import from North Korea of coal, iron and iron ore, with limited exceptions, and import of gold, titanium ore, vanadium ore and rare earth minerals with no exceptions. North Korea will also be prohibited from importing aviation fuel, including rocket fuel. Imposition of a sweeping ban on North Korean bank branches and similar offices abroad, as well as joint ventures with North Korean banks. States will likewise be required to prohibit their banks from opening new offices in North Korea and to close existing ones if there is credible information that provides reasonable grounds to believe the associated financial services are contributing to North Korea’s illicit activities. Requirement on states to inspect all North Korean cargo—either coming from North Korea or going to it—that crosses into their territory. States are also prohibited from permitting North Korea to lease or charter their flagged vessels or aircraft, or from letting their nationals operate North Korean vessels. All overflight of a state’s territory is to be prohibited if there are reasonable grounds to suspect North Korean illicit cargo is aboard, and North Korea will be denied port call access for any seagoing vessels if those same grounds exist. Prohibition on any trade assistance—public and private—that supports trade with North Korea, if it could contribute to North Korea’s nuclear and missile activities. Obligation for states to expel from their territories North Korean diplomats and any other foreign nationals engaged in illicit activities, with minimal exceptions. Prohibition on any conventional arms-related trade with North Korea, including items that—while not serving as arms themselves—can enable North Korea to develop its armed forces. Such a conventional arms “catch-all” provision will help to prevent support for the North Korean military that, while not involving arms directly, advances North Korea’s capabilities. Such items could include all manner of dual use goods and equipment, such as computers, trucks and the like. North Korea is also forbidden to cooperate with other countries to improve their militaries or to receive military advice or training. Expansion of the list of proliferation-sensitive items that North Korea can no longer procure, including any item that another state determines could contribute to North Korea’s nuclear or missile programs. Substantial expansion of the list of individuals and entities subject to the asset freeze and travel ban created in 1718. Individuals named occupy various roles in North Korea’s military, science and economic sectors. Entities include two banks, three trading companies, and seven North Korean government agencies associated with the North Korean military and nuclear or missile programs. The asset freeze will also apply to any funds that a state determines are owned or controlled by the North Korean government or the Workers’ Party of Korea. Expansion of the list of luxury goods banned for export to North Korea. Prohibition on any specialized teaching or training for North Korean nationals in areas that could contribute to North Korea’s proliferation of sensitive nuclear activities or its development of nuclear weapon delivery systems. Reaffirmation that any space-related cooperation with North Korea is forbidden. Altogether, the measures adopted in UNSCR 2270 go well beyond any of the resolutions against North Korea by the UNSC to date. The provisions in UNSCR 2270 are designed to create a targeted, but pronounced economic pinch on North Korea from these sanctions. Inspections of its cargo will delay its remaining legitimate trade and further stigmatize its cargo carriers in foreign ports. The North will find it difficult, if not impossible, to obtain the kinds of services needed to keep its cargo fleet afloat and useful, especially since the caveat previously part of UNSC sanctions—the condition of “reasonable grounds” to suspect proliferation—has now been stricken. This will, in turn, make even its modest residual export goods difficult to move and unattractive to importers. Moreover, by forbidding the import of North Korean mineral resources, UNSCR 2270 will deny the North Koreans a critical source of hard currency and further hinder the growth of its economy, already hamstrung by other sanctions and North Korea’s own poisonous policies that have denied the North Korean population of the ability to develop a legitimate private sector and effective industry. Denying access to government and private trade support (such as export credits and loans) for those few firms willing to take the risks—reputational and otherwise—of trading with North Korea will also be a major blow to North Korea’s attempt to develop new industry. Trade support is vital for companies seeking to do business in risky jurisdictions and, like with the case of Iran in 2008-2010, denying export credits and other forms of assistance will probably have the effect of killing any nascent business planned. Taken in combination with banking sanctions, North Korea will find even its limited access to the international economy far more circumscribed and onerous to use. Overall, if fully enforced, the sanctions adopted in UNSCR 2270 will be a major setback to North Korea’s attempt to grow and develop its economy—a seemingly important policy goal for Kim Jong Un. That said, there are omissions in the UNSC framework that will permit North Korea’s economy to continue plodding along to some degree. Though banking ties will now be very difficult to develop and maintain, there is no blanket prohibition on financial services being provided to North Korea. Consequently, North Korea will continue to have access to the international financial sector, albeit circumscribed and subject to significant scrutiny. US unilateral sanctions measures will help to encourage those few banks that retain ties to North Korea to extract themselves from this business. But, links will remain and those links could be exploited. Likewise, North Korea will still be permitted to import oil. Oil has long been a vulnerability for North Korea and prohibiting its export to the country would have been a major escalation in pressure. That said, the denial of aviation fuel to North Korea is a start and, at a minimum, will ensure that the North Koreans have to produce their own indigenously, putting further strain on their resources. Regardless of the sanctions, North Korea will certainly still engage in smuggling as well to obtain goods that are now prohibited. However, the provisions covering diplomatic personnel found to be engaged in illicit acts will help states police these activities and will lend backbone to domestic authorities who question whether they have the ability to curtail the activities of diplomats. North Korea may even find that it has to choose between using its diplomats abroad for illicit activities or retaining their services for their ostensible diplomatic missions, which may hinder smuggling by raising its perceived risks and costs. The significance of the sanctions adopted by the UNSC underscores the degree to which the international community—and China, in particular—believe that the situation with North Korea is getting out of hand. Put bluntly, these sorts of UNSC sanctions were inconceivable prior to the recent nuclear test and satellite launch. By conducting those tests, North Korea dried up even the meager founts of goodwill available to it, creating the international conditions necessary for adopting UNSCR 2270. North Korea is unlikely to respond passively to these intensified sanctions. There have been reports that North Korea is readying another nuclear test and it seems a plausible response, assuming they are physically prepared to do so. Ultimately, however, it seems likely that these sweeping measures are a precursor to a restarted diplomatic initiative; it is even possible that the price of the new sanctions is such an initiative. The key question is whether such a diplomatic process can result in a mutually satisfactory quid pro quo, probably involving an exchange of nuclear and missile concessions from North Korea, and sanctions and trade concessions from China, the United States and others. This remains unknowable today. As I wrote on February 11, it is possible that North Korea will become even more entrenched in its nuclear pursuit as a result of the intensification of sanctions. It is also possible that the North Koreans will be incapable of making sufficient concessions to satisfy the United States, Japan and South Korea, in particular. But, it does appear that, with the adoption of UNSCR 2270, the international community is finally gathering the kind of sanctions chits necessary to make such a deal work.